GE WIND TURBINES - SAN DIEGO PORT CAN HANDLE THEM - NOT CLEVELAND - Vote NO ISSUE 108! With Passion! Are Kevin O'Brien and the PD correct... there is no global warming!?!? Plain Dealer playing the wrong black card about poverty... it's the soot, stupid! What should word of the year "Carbon Neutral" mean to NEO's future? Submitted by Jeff Buster on Fri, 01/19/2007 - 13:39. Cleveland Foundation President (and ex CIA) Ronn Richard says energy insecurity is the biggest US security threat – not Iraq, and that our national security depends on “butter” investments, not “gun” investments. I agree whole heartedly with Mr. Richard’s persuading the Foundation over his 3 1/2 year tenure into taking forward looking positions in the energy policy and energy manufacturing arenas - in Cleveland, NEO, and Columbus. Donald Lesiak propounded (too often, too long) Tesla’s suggestion that electric power can be “beamed” (rather than transmitted over wires). Cleveland Foundation’s energy specialist, Mr. Stuebi, responded to Mr. Lesiak’s “beam” enthusiasm with sincerity and civility, which diplomacy is often difficult when handling what I considered to be a proposal (Tesla energy beaming) not quite as challenging as perpetual motion. Then, of course, we are already beaming energy as microwaves and RF to our cell phones – so let’s keep an open mind. Leroy Davis, of Brook Park, had practical suggestions for energy security – build with heated concrete floors (as his house was constructed years ago), install skylights (in every new house being built in New Orleans and elsewhere) so the bulbs can go off (skylights even provide some illumination at night! ), and encourage people to work together (difficult for money strapped, dog-eat-dog hierarchically top down legacy managed NEO). Dean of Levin College of Urban Affairs, Mark Rosentraub, introduced Guest Speaker Richard and invited the audience to address Mr. Richard from the open mic after Mr. Richard’s prepared presentation (all oral, no power point). Dean Rosentraub suggested that the audience present “questions only, no statements” which was too restrictive and mostly disregarded by the speakers from the audience. Mr. Ricciuto’s “Appreciative Inquiry” is the right approach. Herb Crowther pointed out that the kilocalories of energy stored in the iron and concrete materials in the Marcel Breuer building were a reason on their own to recycle the structure – not demolish it. SPEAKING TO THE REI CHIOR: Dean Rosentraub privately expressed his enthusiasm over the more than 200 persons who took the time to attend the free CSU forum. When I looked around the audience, I recognized many, many of the same faces that were brought together at Case in 2004, 2005 by Ed Morrison’s determined REI team of Sue and Craig James (Catalyst Strategies ) and Case staff Betsey Merkel and Susan Altshuler. The REI effort was funded primarily by SBC Global and SBC should get credit for bringing much of the Levin audience out networking into the “civic space” which Morrison so strongly advocates is the only model (as opposed to the traditional Union Club, Key Tower, Terminal Tower, Republic Steel top down model) which will lead to the rejuvenation of NEO. Case’s Myron Roomkin was misguided when he chose to shut down REI – Now CSU is the benefactor of the tremendous “free” publicity which CSU generates for itself by engaging with the public. I appreciate CSU’s welcoming and efficient open-architecture presentation “atrium auditorium”, as well as the cheese and coffee which was gobbled up by the students as soon as the public emptied from the building. Submitted by Charles Frost on Fri, 01/19/2007 - 15:36. Very well said, thank you. I too saw a number of the "Usual Suspects" from the REI days. I saw wind people, solar people, sustainability people, an LEED architect, treehuggers, and more. I then remembered that the one comment from the floor was recommending that we all pull together for a common cause (my paraphrasing). That reminded me of, and combined with Mr. Ricciuto’s note today (www.jackzen.com): "we do not see the world as it is; we see the world as we are", I realized that just maybe this long winded sustainable solar fan of LEED building wasn't seeing the forest for the trees he was busy hugging. I guess I feel that if/when all this oil "stuff" and/or global warming activity comes to the fore, we will need all of these technologies. Solar, biofuels, wind, geothermal, radient heating, insulation, LEED, biodiesal, energy conservation, fuel cells, batteries, hydrogen storage, landfill gas, biomethane, waste to energy, "clean coal", hydropower, and unfortunately maybe even more nuclear fission. I am not known for being the most sociable of people, but I just wonder if there is a way that we could all band together for the "common cause" in some fashion. There are "web rings" of people out there in cyberspace who share a common bond. There are social groups that collect around a common, specific, concern..... Maybe "here" is the place, but I don't know how many of "us" frequent this corner of the web. Submitted by Norm Roulet on Mon, 01/22/2007 - 17:26. I think it is safe to say if anyone posts an important issue about sustainability on realneo just about everyone interested in sustainability will have access and know about it - BFD will pick it up, etc... over time these postings get 1,000s of visitors and reads. Regular REALNEO visitors and new members will all have the ability to comment and post on their own so this is as open as it gets. Environmental issues always get a good workthrough here - lots of traffic - lots of comments and dialog - better than anywhere else I can think of in NEO. You are an excellent drive of that - thanks for sharing your insight. Submitted by Zebra Mussel on Mon, 01/22/2007 - 23:09. OI, i hear they squelch posters over there on that other so called 'community'. this hoot en annie, non-linear thought, and Distruption. Submitted by Susan Miller on Fri, 01/19/2007 - 16:18.
and I only came in at the last doggone minute. But there was an energy there that has not recovered. Even though REI became i-open and continues, there was a splintering it seems that has only recouped as the "usual suspects" (I only recently began to sniff around this area out of only personal concern) are seen at E4S, CSU, Whiskey Island and commenting or blogging. I do so wish that there were REI Tuesdays again… in a central location and a regular group. The ideas that I heard espoused at REI opened my eyes to a hopeful future for our region when I had decided all was lost or at least mired in closed door negotiations, or broken governmental operations. Maybe there is a way that a group could work with Ed et al to arrange a "regular" meeting around sustainability issues in a neutral place (is there neutral ground in Cleveland's politically charged educational environment?). Some of us dropped away from the i-open crew as they struggled to recover from the addlepated actions of Roomkin. There was plenty of confusion, but they are still at it, and perhaps we can reconvene there and reemerge as a place for plain talk and innovation with all the players returning to the table. Maybe Steubi would even join us. It would be good, as I said to Mr. Richard, to share the plan, the hindrances, obstacles, successes and ideas with the folks who have been involved in this prior to his or Steubi’s appearance on the scene. It would be a means to engender the support of these interested and innovative thinkers (and onlookers like me). And as far as press/a communications strategy, you couldn’t ask for a more articulate, more well educated journalistic presence than the blogger filled community here in NEO. Meetings could be videotaped and podcast for those who were unable to attend. We have the ingredients, no? Ed and Betsey, are you reading this? Submitted by Norm Roulet on Fri, 01/19/2007 - 16:44. It is good you bring this up - Sudhir and John Hanson spoke at an I-Open @ Future Center last week on greening Ingenuity - very interesting and well attended. Steubi dialed in and offered his suggestions and they were excellent. I've been to many good events at Future - there's a good scene developing. I think what we need to work on is coming together behind specific objectives and taking action as a result - the Foundation chose who they wanted at the table and brought in an outside Black-Belt to facilitate their meetings to formulate their strategy - they developed it their way. I think it is cool Ronn is sharing insight and he has lots to share, but I don't think they are looking for outsiders on their planning. I do think Ronn will be receptive to other strategies and solutions, wherever they come from, and Steubi will be very helpful - but I think we need to be specific in what we plan to accomplish. Submitted by Norm Roulet on Fri, 01/19/2007 - 16:28. I'm glad you posted on this - I was working on a write up last night and never had a chance to finish it. You captured the event really well - I enjoyed hearing Ronn in a casual envirnment and you are so right about the roots of this at REI - CSU offers great programming like this very often, and so does Case, so we really have a huge wealth of free intellectual collaboration in this community, but REI was a very good thing. You write up covered some really interesting dynamics without hitting on the one we discussed at the end of the meeting - why not send out RFPs around the world to see who offers to invest in developng wind resources here - power generation - view that as separate from the manufacturing. They should work together - we shouldn't just be looking at one huge plan but both manufacturing and generation. Also, I feel we are overlooking R&D of smaller scale innovative turbines for home and business use - the 1,000,000s of units scale technology - lots of manufacturing and assembly required. Submitted by Susan Miller on Fri, 01/19/2007 - 18:31. "In an amazing victory for our new energy future, the House of Representatives passed the C.L.E.A.N. Energy Act of 2007, taking billions of dollars in subsidies away from oil companies and investing it into renewable energy sources such as wind and solar. Congratulations, and thank you for all your hard work during this campaign! Big oil companies are swimming in a sea of record-breaking profits while American consumers and taxpayers pay the price. In 2005, the world's biggest oil companies reported a combined $111 billion in profits. In the first three quarters of 2006 they reported more than $94 billion. Despite earning record profits, oil and gas companies continue to benefit from billions in handouts courtesy of American taxpayers. Between tax incentives, below-market fees for drilling on public lands, research and development subsidies and accounting gimmicks, these companies will receive more than $31.6 billion from the federal government over the next five years. Some of most outrageous handouts to Big Oil allows companies drilling for oil and natural gas on public lands to pay below-market fees, or royalties, for the resources they extract. Oil companies are currently slated to shortchange taxpayers by $9.5 billion over the next five years. Another giveaway allows oil companies to write off the costs of oil drilling and refining. Together, these giveaways total more than $4 billion over the next 5 years. Submitted by Norm Roulet on Mon, 01/22/2007 - 04:03. Submitted by Jeff Buster on Mon, 01/22/2007 - 11:39. This is an eight leg jack-up barge with a crane which is mounted on a circular railroad track. Each of the black pipe legs has a hydraulic pawl mechanism that shoves the leg down (or up) clamping and releasing it in short strokes. Crane counterweights ride the track under the stubby rear red colored truss to offset the load of the lift. The nacelle of the turbine is assembed on shore with 2 or the 3 blades mounted to the turbine shaft, (see the third blade on the deck of the barge). Some of the newer turbines have nacelles which weigh in at 500 tons. That's heavy! 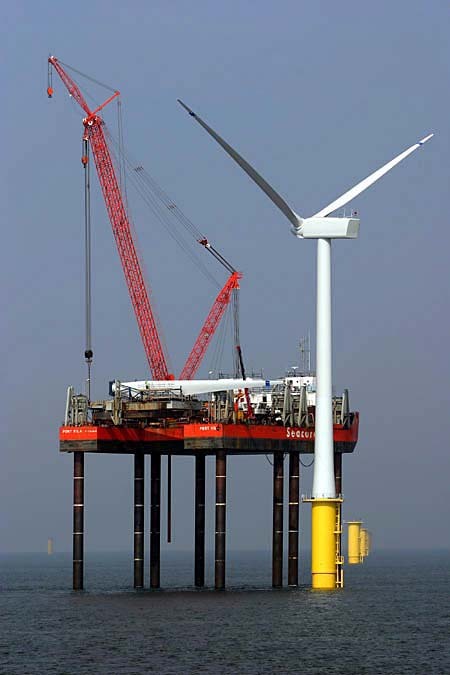 Lifting can only be done in very calm weather, (look how calm the water is in this photo) and if the turbine breaks down in the middle of winter when the winds are strongest, it may be months (summer) until the unit can be repaired if a crane is required. Service men come and go by helicopter landing on top of the nacelle - pretty cool - of course the machine has been first stopped and brakes applied by telephone SCADA link. You can also see the line of turbine tower bases (yellow) in the distance. These have been installed by a totally different rig. Depending on soil type on the sea floor, they may be "suction piles" or huge driven pipe piles, or other type of foundation. There are tripod-like support structures which have been designed, which are intended to be floated out to location and then the tripod end flooded and sunk and the other tower end uprighted. That is more like "Texas Tower" oil well drilling platform technique. You will note that the Cleveland Port Authority doesn't have any equipment anything like what you see on the web site linked in Norm's comment. I don't know of any on the Great Lakes, and I am uncertain whether or not this size of equipment can move through the St. Lawrence Seaway into Lake Erie. We have no tradespeople who know this business in NEO, even the cranes and rigging crews which erected the land based Bowling Green turbines came from out of state. Mr. Richard and Mr. Stuebi, please reconsider your BHAG. Submitted by Norm Roulet on Mon, 01/22/2007 - 15:08. What really struck me in these photos and your informative posting above is how big everything about these operations is. Huge equipment, ships, cranes, challenges. Also, to see such massive offshore operations already going around the world says how doable it is in the Great Lakes and I suppose other bodies of water around America and the world. Is Cleveland or more accurately NEO the place to lead aspects of this industry is a reasonable question? Can we create federal, state, regional and local incentives that encourage investment in wind technology investment and use in Ohio? There are movements in that direction at all levels for NEO and the bigger issue is whether Ohio and NEO can move to an especially attractive position. We do manufacture components for turbines and should accelerate that as the industry grows. Can we manufacture other components? Surely - especially in certain clusters that local economic development leadership knows and manages well... this has been one of the top priorities of the top 150-driven regional development model. Can we invent here better wind power technologies for the world? We have a legacy of this with Brush and NASA and should invest to do more!. Can we train a workforce to make the region a world leader in this field? This will require coordinated collaboration among high school and college educators and trade and industry leaders, which is a significant expectation. Could we be a major manufacturing region for entire wind turbines? It is conceivable, at both the large and small scale, if we do all of the above very well..
Can we be a place where there are lots of wind turbines generating electricity? Yes, especially if we do all of the above very well. Could some be on the lake? It is reasonable to plan for that - whether that should be the highest priority is not yet clear. How best can the foundations optimize the value of their investments in this field? That is not yet clear. There are probably a few other big questions to answer about wind in NEO, and then task forces should work on fleshing out each opportunity area and determine how signifiicant each opportunity is and pursue the best outcomes.